Looking for a special gift for someone? Look no further than the WRUFC Club Shop! The new Italian lambswool sweater with the club logo has just arrived and priced at £45 is a very good deal. Why not buy a club tweed waistcoat and jacket? Courtesy of Brook Tavener, quality tailors since 1912 and sponsors of the club. 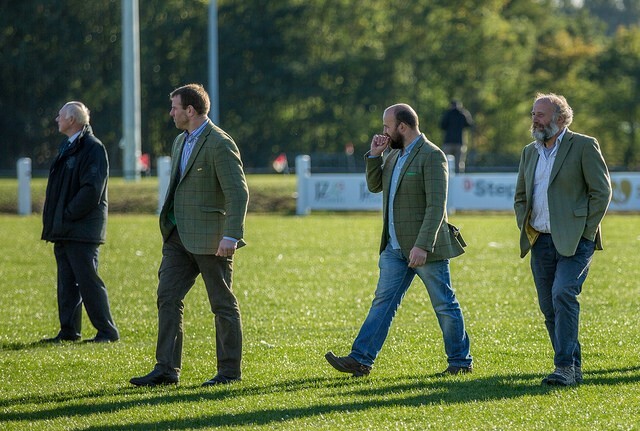 Our players and supporters alike have been dazzling the opposition in the club’s own smart country tweed (kindly modelled by the Mason men!)….. The shop has a range of waistcoats and jackets now in stock and can have other sizes delivered within 7 days if in stock at Brook Taveners. Please visit the shop on first team match days and any Sunday during the season or e-mail us at shop@wharfedalerufc.co.uk. We also have a selection of warm hats, scarves, training kit, umbrellas and other branded merchandise. The shop price list is available by clicking here. Shortly we are going to be adding caps and scarves to the club’s tweed range, so watch this space!! !